Drain all beans except Baked Beans. Mix them with 1 can of undiluted tomato soup and 6 oz. can tomato paste. Add brown sugar, mix and let stand. Hot Sausage (remove casings and crumble), Sweet Sausage (remove casings and crumble). After sausage is cooked, drain off excess grease. 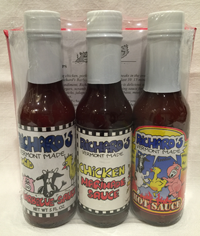 Mix beans and cooked sausage and add Richard's Barbecue Sauce -- flavor of choice. Pour into large casserole baking dish and arrange sliced pepperoni over the top. Bake uncovered for 1 hour at 350 degrees. 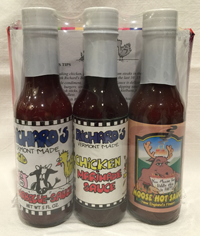 Take part in our recipe contest and we'll send you a bottle of free Vermont Made Richard's Barbeque Sauce. Submit your best barbeque recipe and we'll test it out. If your recipe is approved, it will be posted on this website. All winners will receive a bottle of barbeque sauce absolutely free! One entry per family please.